Improving business efficiency is a perennial concern for any company that hopes to achieve “best-in-class” operations. 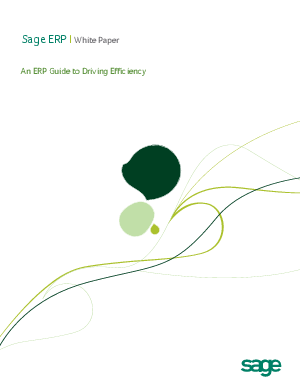 Businesses that successfully improve efficiency stand to reduce operating costs while improving the effectiveness and profitability of their operations. They also gain time to devote to strategic planning. While many companies employ siloed applications and manual business processes, best-in-class companies are more likely to fully exploit ERP technology. Standardizing and automating business processes—locally as well as across multiple locations and countries—to accelerate business operations. Offering a fully integrated suite of business management applications that share a common dataset and extending these applications over the Internet, allowing visibility and collaboration across departments, as well as with customers, partners, suppliers, and remote users. Providing flexible and customizable reporting to improve business reporting, analysis,and insight.